Intestinal worms have an incredibly bad reputation. The thought of them sneaking around inside our bodies and eating us from the inside is pretty unpleasant. But for decades, results coming out of lab after lab have shown that some kinds of helminths can be extremely beneficial to their host, and aren’t parasites at all. Just 100 years ago, before toilets and running water were commonplace, everybody had regular exposure to intestinal worms. Thanks in part to modern plumbing, people in the industrialized world have now lost almost all of their worms, with the exception of occasional pinworms in some children. Intestinal worms are properly called “helminths,” which most dictionaries will tell you are parasites. Exploiting their hosts, draining resources, sucking the life out of the body – that’s what parasites do, by definition. Indeed, many helminths, including the porcine tapeworm and the human hookworm, are known to cause disease and even death in the human population. Parasitic worms are still a big problem in some parts of the world. But for decades, results coming out of lab after lab have shown that some kinds of helminths can be extremely beneficial to their host, and aren’t parasites at all. These helpful helminths are mutualists, a type of organism that receives benefits from its host, and also provides benefits to the host. For example, my lab, working with a Duke University colleague, Staci Bilbo, recently showed that the presence of helminths in pregnant rats protects the brains of the rat pups from inflammation. In other words, it seems that mom’s helminths can protect unborn babies. And that is just the tip of the iceberg for what these critters can do. Having worms isn’t necessarily bad for you. The largest randomized trial ever performed in human history – involving two million children in India – looked at how helminths affect health in places where humans naturally have them. The study showed that mass treatment with an effective deworming drug did not increase body weight or survival. Shockingly, the helminths didn’t seem to be doing any harm, since getting rid of them didn’t improve health. So that study seemed to show the absence of harm; could these helminths actively be doing good? Missing mutualistic helminths is a key factor in this, and is apparently a major contributing factor to a very large swath of disease, including allergies and autoimmune conditions. For instance, helminths have been found to protect laboratory animals from a wide range of allergies and autoimmune conditions. And recent findings suggest that many types of cancer can be reduced by helminths. The idea has been demonstrated by preventing colon cancer in rodents, and it is hoped that it will reduce the burden of cancer in humans by decreasing chronic inflammation, a condition that can give rise to cancer. In controlled studies in humans, helminths were shown to halt the progression of relapsing remitting multiple sclerosis and effectively treat many individuals with inflammatory bowel disease without report of adverse side effects. How Do Worms Work With Our Immune System? The idea that helminths can help us with a wide range of inflammatory diseases that plague modern society makes a lot of sense when considering the science behind how helminths interact with our immune system. Helminths have been a part of the ecosystem of the body for so many millions of years that they have become an integral part of that system. Mutualistic helminths help regulate immune function, stimulating our body to build regulatory networks of immune cells that decrease general inflammation without hurting our immune system’s ability to respond to danger. In addition, these helminths produce their own array of anti-inflammatory molecules and give our immune systems much needed exercise, all of which decreases inflammation. And a recent study showed that the addition of helminths to laboratory rodents dramatically changed the balance of the gut ecosystem, shifting the bacteria in the gut toward a much healthier balance. With these factors in mind, it would be hard to understand if missing our helminths did not cause health problems. My laboratory began work a few years ago looking at the sociology of “helminthic therapy,” the use of helminths to treat disease. Working with Janet Wilson, a sociologist at the University of Central Arkansas, we found that thousands of people are using helminths to self-treat a vast array of inflammation-related conditions, from inflammatory bowel disease to hay fever to multiple sclerosis to migraine headaches. At the moment, there is no helminth approved for medical use by the FDA, and we found that people generally obtain their organisms from one of a few companies that sell expensive and often unregulated products, which can be risky. Part of our study included a survey of helminth users, and most people filling out the survey reported that helminths treated their inflammatory conditions more effectively and with fewer side effects than did pharmaceuticals. We also found that some “self-treaters” are the using a helminth called the rat tapeworm (Hymenolepis diminuta), which sounds truly disgusting. 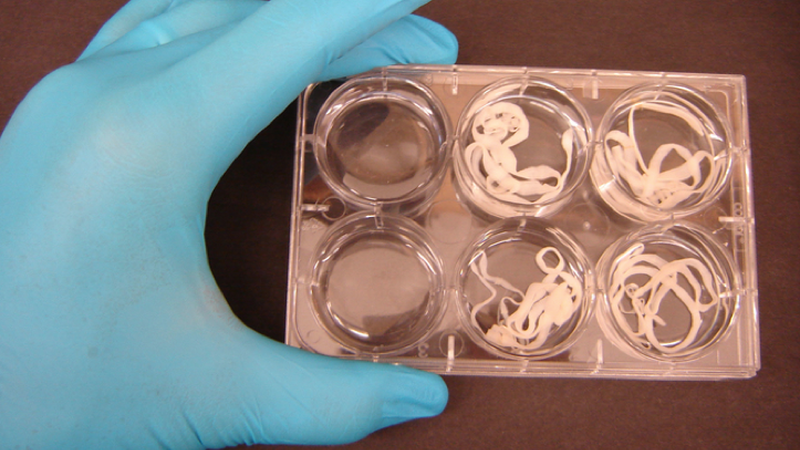 However, people are using this helminth because it is inexpensive and easy to produce, and may provide a very effective treatment for a range of inflammation-related diseases, including migraine headaches and depression. People eat them and report that about 30 worms per month does the job, although the number varies depending on the individual. After being swallowed and passed into the small intestine, the tiny worms almost certainly hatch out of their jelly-like capsule that has protected them since they first hatched from an egg. At that point, they begin to interact with the immune system, reducing inflammation like any other helminth. But then, with rare exceptions, they vanish mysteriously, never maturing into adults and producing eggs. Because rat tapeworms don’t colonize our intestines the way that some other types of helminths do, an individual needs frequent exposure to have them in their bodies consistently. The rat tapeworm has been used in the laboratory for decades and blocks experimentally induced colitis in mice more effectively than daily immunosuppression with steroids.In fact, this is the same helminth we use in my lab to protect the developing brains of rat pups from inflammation. But no researchers have ever studied using rat tapeworms on humans to treat disease. Why Aren’t Helminths Catching On?